The very first bulb to cheerfully announce spring is the snowdrop. As the last winter snow melts, carpets of delicate white flowers emerge through last year’s fallen leaves. Snowdrops will reliably return year after year despite Mother Nature’s most challenging winters. The botanical name, Galanthus, comes from the Greek words Gala meaning “milk” and anthos meaning “flower.” They will thrive in the rich, moist soil usually found in the shade provided by deciduous trees. Few bulbs can tolerate shade, but snowdrops develop in the winter sun well before the leaves of trees and shrubs have expanded. Their flowers last for several weeks beginning in early March and persisting through the cool days of spring in early April. Once planted, Galanthus require no maintenance. One of the most treasured features of this easy-to-grow perennial is its ability to propagate on its own and develop into large masses. It is this trait that gives snowdrops the label “good naturalizer.” Many other popular bulbs such as tulips, hyacinths, and alliums flower beautifully the first few seasons, but eventually weaken and disappear. Galanthus may be left undisturbed for years to form large, densely packed colonies. The most readily available bulbs are those of Galanthus nivalis or common snowdrop. Its flowers of 3 nodding bells are 1 inch long and white, surrounding smaller petals bearing a hint of green. Height may vary from 4 to 8 inches. The giant snowdrop or Galanthus elwesii has flowers up to 2 inches long and grows up to 12 inches tall. Many varieties exist with minor variations in flower size, color, and form. Galanthus nivalis ‘Flore Pleno’ produces interesting double flowers that can only be appreciated by closely admiring them at ground level. 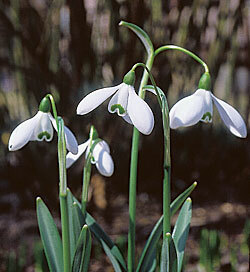 Galanthus nivalis ‘Sam Arnott’ grows vigorously and produces extra large flowers. All snowdrop flowers bear a faint honey fragrance that increases as the colony expands. If the early season ground is not too frozen, a small division may be dug and potted indoors for a fragrant sampling of spring glory. 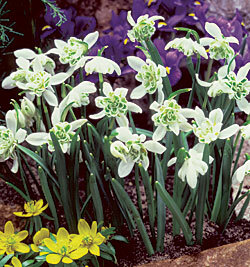 Snowdrop bulbs are always available in fall and are very inexpensive. Bulbs should be planted in drifts of 25 or more for the best show. For that “natural” look, the best way to space bulbs is to toss them on the soil and plant them where they land. Work in organic matter such as compost, sphagnum peat moss, or aged pine bark and bury bulbs 3 inches deep. After a few seasons, clumps may be lifted after flowering and divided into sections of 3 to 4 bulbs for replanting. Plant them in a rock garden, as an edging plant, under trees, or along a woodland path or border. Snowdrops flower at a time when few other plants are in bloom. The bright yellow blossoms of winter aconite (Eranthis) are an exception that will thrive alongside snowdrops. Hellebores, or lenten roses, also come into bloom this early. 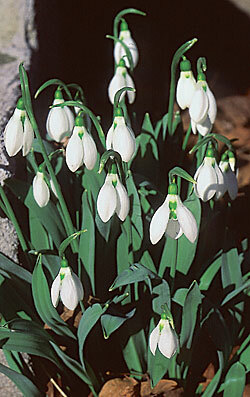 Their large, coarse leaves and showy flowers would certainly benefit from an underplanting of Galanthus. Of course, the showiest companion for any spring bulb is the pansy. When planted in the fall, pansies will bloom until the holidays and begin again at the first hint of warm weather. Snowdrops may also be forced to bloom indoors ahead of their outdoor schedule. Using well-drained soil, plant bulbs 1/2 inch deep and 2 to 3 inches apart in a 6 inch pot. Water and store in a garage or refrigerator where temperatures can be maintained between 35 and 45 degrees for 8 to 10 weeks. 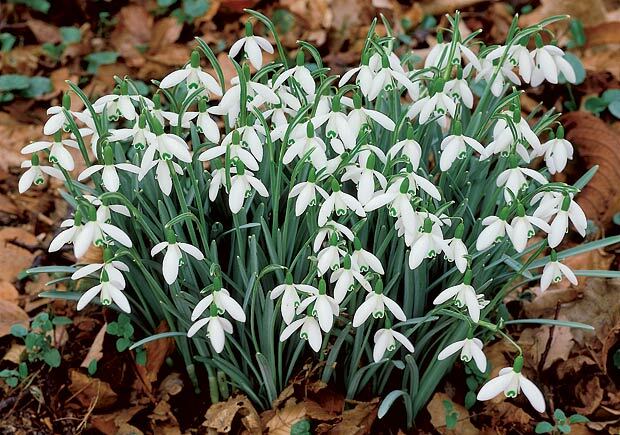 Snowdrops will bloom 2 to 3 weeks after moving to a warm, brightly lit location. Plant outdoors when flowering is complete and wait for a repeat performance next spring! Remarks: The first bulb to announce that spring has nearly arrived! Good naturalizer, as it forms clumps that increase in size to form larger masses. Since bulbs are small and inexpensive, plant in drifts of a couple dozen or more. Check out our Plant Focus on Snowdrops. Thanks for reading!